Even though it’s Monday, can I still do a “Friday” Seven Quick Takes post? I hope so. I’m going to. I know I haven’t written any serious posts lately (other than this one, which was kind of serious), but there’s a lot of serious things on my mind still. Lots I’m pondering about, hoping for, sorting out, and experiencing. I specifically have two marriage posts dwelling in my mind that need to be written soon, but these serious posts take time and take thought and are things where I have to sit, unfocused on anything else, headphones and music on, and commit to writing. So I’m working on them. They are there in a file in my brain and will be coming soon to this blog. In the meantime, let’s overcome this writer’s block by doing what writers do: write. I’m joining way-too-late-to-be-considered-fashionable to This Ain’t the Lyceum’s Seven Quick Takes Linkup here. 1) The weather has been wonderful lately. 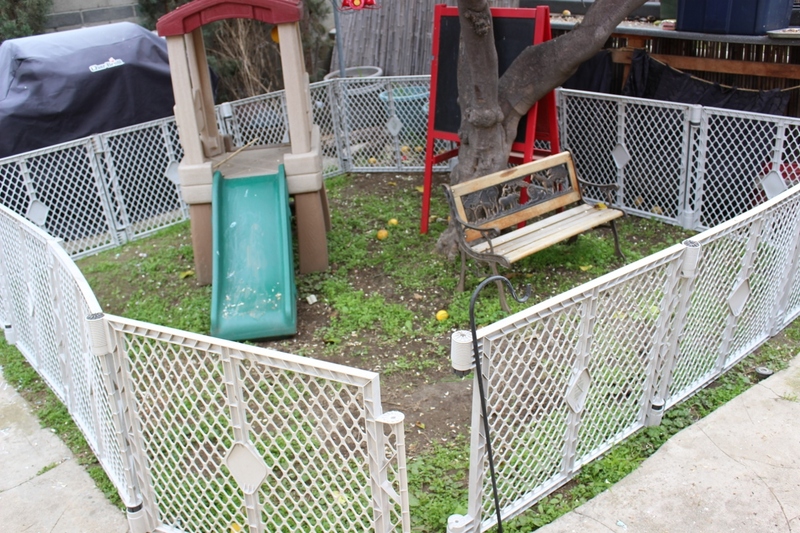 As a newly unemployed, I mean, newly christened & official SAHM, I’ve been spending a lot of time fixing up our backyard area. 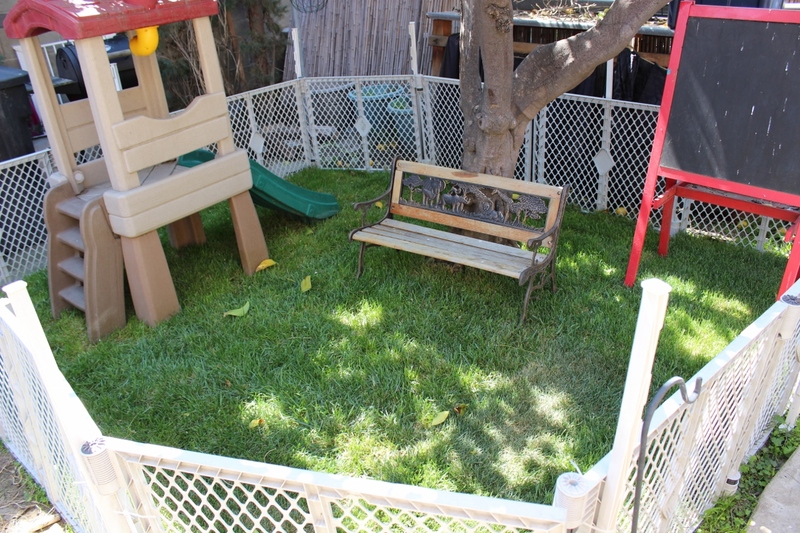 I put down sod and made a nice fenced off play area for S.
2) I’ve also been doing work in the garden. It’s funny. 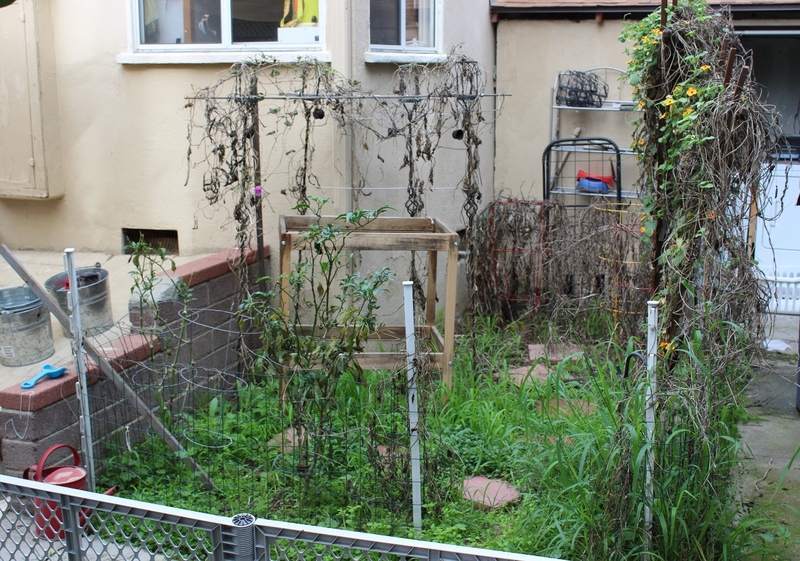 Every spring, I always put all this work into a garden and carefully plan out where everything is going to go, making sure to match companion plants together…and then every year come July-ish, it gets hot and bugs and weeds take over and I give up and everything dies. But yet EVERY SINGLE SPRING I somehow think that this new year is going to be different and I do all this work and plant new things. Sigh. But I really actually do think that this year is my best garden yet, ha ha ha. 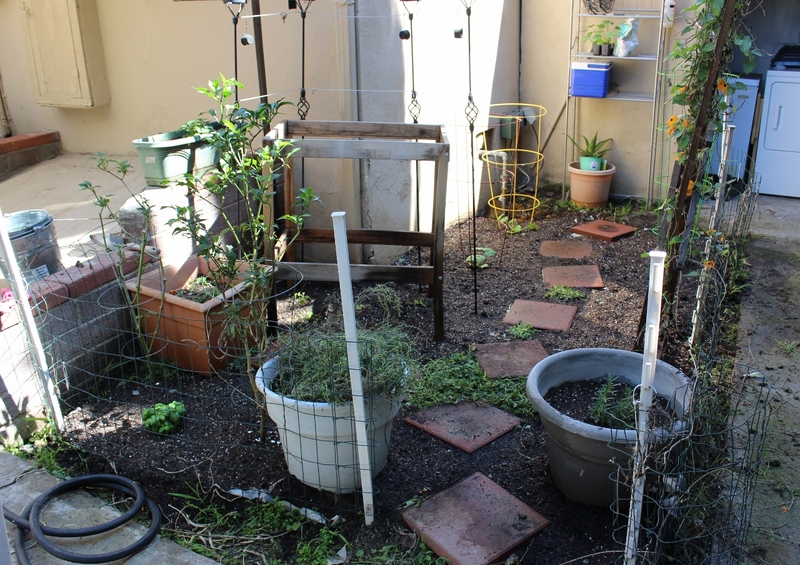 Maybe I’ll write a post eventually with garden updates and tell what I did different. I took plenty pictures as I was digging up and planting just in case I ever felt like writing a blog post about it. So I guess I should at some point. I really should. 3) I did another one of my consignment sales this past weekend. I made about $180. I also bought a few things in the pre-sale that I’m very excited about. 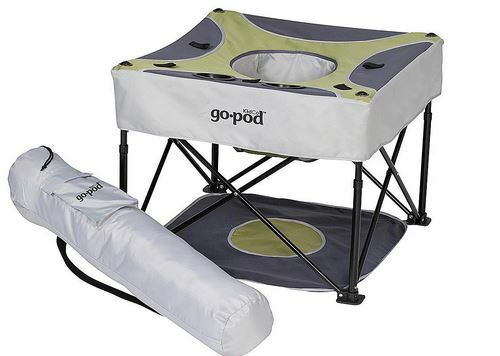 Namely this: KidCo GoPod Portable Activity Seat (affiliate link) which I got for $20 and am way excited to take it camping this summer. I didn’t really do garage sale shopping and then flipping for profit this time around, I mostly just got rid of stuff around the house. But I’m kind of getting the groove of these sales now and I like them. 4) KP’s sister came in town last week to visit. We went to Disneyland and it was great. A bit different than our first family trip six months ago, but we felt more confident how to handle the day this time. We took a lot of great pictures, but below is probably the most memorable one. 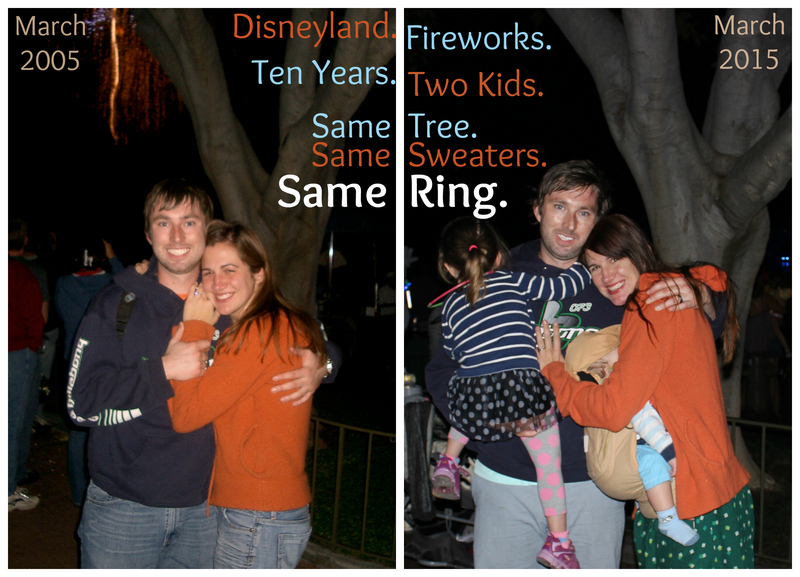 The picture on the left was taken the night we got engaged, March 26, 2005 (the story of how we met here). The one of the right was taken March 16, 2015. Wow. We’re almost at our 10 year wedding anniversary. I cannot believe it. Cannot believe it at all. But it’s probably why a lot of marriage posts are likely to be written in the coming months as we near our actual anniversary in October. A decade of being married. This is no small feat. 5) I spent the better part of 2 days at the end of last week playing with the theme of this blog and learning the basics of css code and how to make some small changes. Why? Um, because it’s kind of fun? Because it’s interesting? Because I really wanted my new header image at the top of the page instead of those dots that used to be there and there was no other way other than to change the code myself? I don’t know. But I spent a lot of time doing it. 6) I haven’t talked about a lot of screenwriter stuff in here lately even though originally that was kind of one of the main elements of this blog. As I’ve touched on in my hindsight posts (#1, #2, #3, and #4) and also in my very first post, we had a couple rough years in there. Lately though, life and finances have been much steadier and KP and I have stopped to catch our breaths some. We’ve refocused, and are looking at paths and projects and recognizing what matters most in life a bit differently than before. There are still inklings of future projects here and there and possibilities to be excited about and I’m looking forward to what the future may bring for KP and for us. But for right now, we’re enjoying the much-needed calmness of a momentary steady life. 7) I’m still plugging at my invention. Plugging away. Oh gosh. It’s the end of March. I really need to look into this patent process more.